This impressive chapel, built in the classical style, was erected in 1841-2. It replaced a modest one built only a few years earlier in 1833, which was described at the time as "very neat and substantial", measuring 38 ft x 26 ft. and cost about £380. Thr 1833 chapel still stands & is now a private residence. The chapel in the photograph had a spacious interior with a gallery around three sides supported on cast-iron columns. 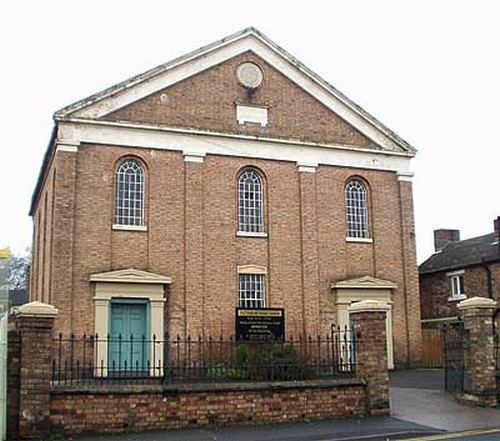 The inscription on the tablet in the gable reads "WESLEYAN CHAPEL/ MDCCCXLI". In 1851 it had seating for 560 worshippers. On Census Sunday 30 March 1851 there were 140, 105, 219 worshippers at their three services in the morning, afternoon & evening. There were also 196 Sunday scholars. The chapel called "Fletcher Methodist Church" has now (2016) closed and has been offered for sale.